There is currently a lot of work under way on Riccarton Road. Two lanes of traffic, one in each direction, will be maintained throughout the works. Temporary traffic management will be installed. There may be times when vehicle access to properties is restricted. The work period is weather and road operations dependent. Kerbing, ground investigation and water main installation work is under way. There will also be localised ground works as traffic lights will be installed at the railway crossing. During April, Harakeke Street will be closed at the junction with Riccarton Road and Mandeville Street will be left in, left out. Over May and June the road surface will be repaired. The cafe in Dovdeale Village – DD01 closes its doors this weekend in preparation for clearing of the villages. The same team will continue to trade in UCMix on the ground floor of the Business and Law building on the Ilam campus. Those in need of coffee on the Dovedale campus can still get a great cup at the UCSA cafe – The Collective. Congratulations to Fine Arts Senior Lecturer Steve Carr who has won the Australian Photobook of the Year Awards 2017 with his publication ‘Variations for Troubled Hands’. Steve Carr is a visual artist and senior lecturer in Film at School of Fine Arts. We caught up with Steve following his win. A: My work has always been about moments of magical transformation and the interrelations between performance and the lens. Q: What does it mean to you to win this award? A: With about 90 publications accepted into the AUS/NZ award, it was a great honour to win the Australian Photobook of the Year Awards. The selection panel and judges are all highly regarded in the field, so it felt extra special to have that kind of acknowledgment. Q: What was the inspiration behind the book? A: The book presents a serial composition of a Royal NZ Ballet prodigy named Cadence in 12 parts, choreographed and performed by fingers, forearms, tendons, palms, wrists and thumbs. At once an interactive object and a performance space. A: Here is the judge’s comment: An original concept that combines performance, dance, photography and film, into a beautifully executed photo book. An emotive and meditative object that draws you in as a participant rather than just an observer. Many of you may have wondered how to dispose of the compostable packaging the cafes on campus are now using. The Sustainability Office has the solution to some of the compostable packaging options at UC! You already know coffee cups are accepted in the blue bins on campus, well now the blue bins will accept some types of compostable packaging too. It is important to check the new signage on the bins, to see if your packaging can go in the blue bins. 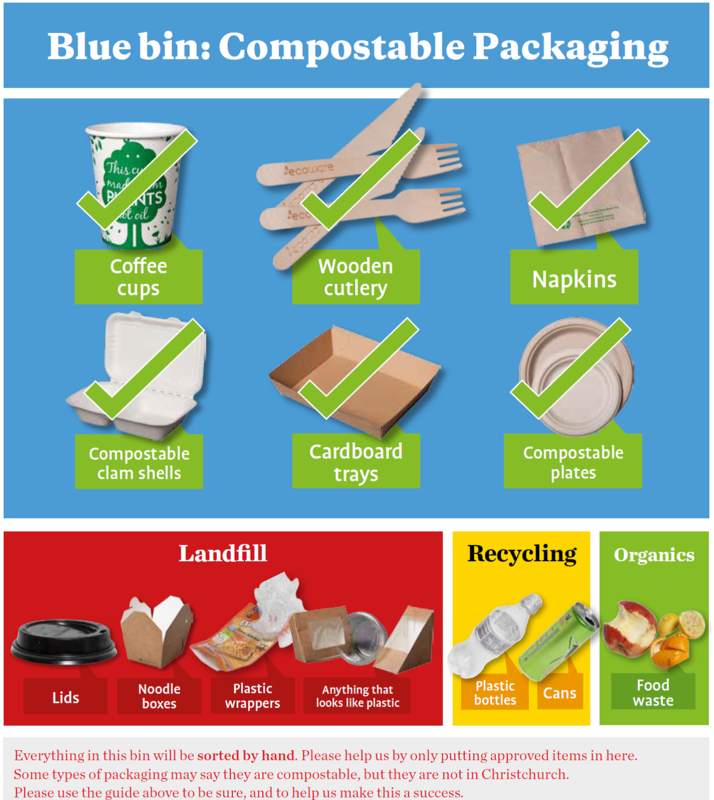 Remember, although some types of packaging may say it is compostable, they are not all accepted in Christchurch by our commercial composting facility. A quick and easy way to check, is to see if there is anything that looks like plastic on your packaging (regardless of whether it says compostable or not!). If there is, please empty your food waste into the green organics bin, and place the packaging into the red landfill bin. Remember, everything in the blue bin will be sorted by hand. Please help us by only putting the approved items in these bins, and everything else into organics, landfill or recycling. Follow the simple guide above to be sure, and help make this a success at UC.